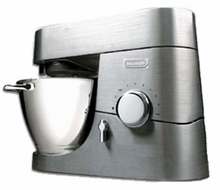 Heavy-duty 780 Watt motor with 10-year warranty: The most powerful 5-quart stand mixer! Automatic electronic speed control maintains speed and power regardless of load. Large 5-quart stainless steel bowl with handles. Non-Stick Dough Hook is specially designed to make mixing and kneading quick and effortless. Stainless Steel Whisk produces a light, fluffy texture. Perfect for mousses, souffles and meringues. Non-Stick Flat Beater increases efficiency and reduces beating time. It's ideal for mixing cake and cookie batter. Splash guard allows you to easily add ingredients. Overload protection device: The unit will automatically terminate operation if the capacity exceeds the suggested amount. Unique mixing action: The contrary motion of the beater and the beater socket results in thorough and perfect mixing results every time. Four concealed power outlets for over 12 optional attachments. Brushed die-cast aluminium body and components combine for optimum quality and durability. Tilting head lift for quick and easy tool change and bowl removal. Size: 15.75" x 11.6" x 9"